James and I were outside of Charlotte, NC this past weekend teaching PRI Integration for Fitness and Movement. 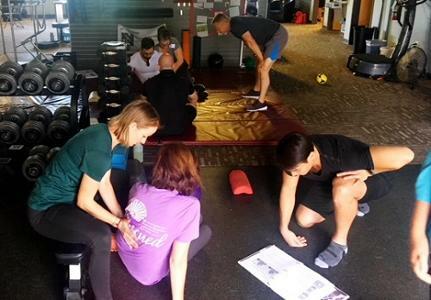 We started the weekend highlighting rib mobility and breathing mechanics to empower abdominals and core organization. Then we broke down key components of the frontal plane to empower mechanical position around the pelvic-hip complex and integrate upper abs with lower abs. We planned out several different labs which isolated the various components in a systematic way so that attendees could feel relationships build off one another. PRI is such a gift to us all. By understanding the patterns at which position is lost, we can train muscles and optimize functional movement in a systematic way for motor learning. This approach truly is “functional fitness” as it preserves key mechanical relationships needed for biological well-being and performance. By learning how to train each side of the body independently and optimize frontal and sagittal relationships, we can improve how the brain regulates stability and mobility. This is so important for today’s culture of fitness! Our programming recommendations incorporate building and developing movement variability, with the initial stages establishing the fundamental breathing awareness, and then subsequent stages incorporating foundational principles to improve three dimensional core control, proximal stability, and independently limb function. From Kyndall Boyle, PT, PhD, OCS, PRC: "The PRI Fitness course definitely exceeded my expectations! I enjoyed witnessing the ongoing evolution of PR science in both the manual documents and in James and Julie’s teaching. I love the organization of preserving the sagittal then frontal and lastly transverse planes! Fine tuning my verbal cues with patients the next day after the course made an immediate and noticeable difference to them! Thanks for a great course and all the hard work and time that went in to preparing it!" Thank you ladies for sharing your feedback! Also special thanks to the Precision Fitness team and Pierre Ortiz for hosting and bringing this course to Cornelius, NC. Great facility and staff there doing great things for their community! If you haven’t attended the PRI Integration for Fitness and Movement course yet this year, sign up today! You won’t regret it! We have three PRI Fitness courses left for 2018! We will be outside of the LA area in Redondo Beach next month, followed by outside of Chicago in Northbrook in September, and finally we end the season in Philadelphia in October. Lastly, if you know of a good facility to host this course in 2019 please email the institute directly as we are currently working to finalize the course schedule for next year!